While a divisor of 690 is typical for steelhead, this divisor varies significantly across individual fish (how to calculate divisor for an individual fish). A key conclusion from our research is that individual fish, just like individual humans, have different shapes and therefore different divisors. The range of variability for the divisors of individual fish for the 115 steelhead in our sample are shown in the chart below (click here for larger printable version). 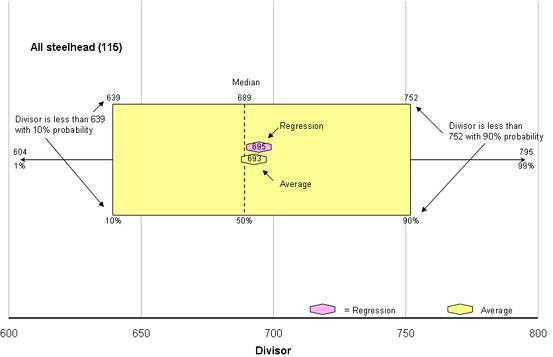 The chart shows that the median divisor for this sample of 115 steelhead is 689, which means individual-fish divisors are equally likely to be above or below this number. Other valid methods of analyzing the same data include calculating the average divisor (693), and the regression-based divisor (695). However, the difference between using 689, 693, and 695 is too small to be meaningful for any practical purpose. So we have chosen to use 690 for simplicity. As shown in the chart, about 10% of individual fish have a divisor less than 639, and 90% of individual fish have a divisor less than 752. Thus, 80% of individual steelhead in our sample have divisors within the range of 639 to 752. Further inspection of the data shows that about 90% of individual steelhead have divisors within the range of 621 to 759, which is +/- 10% of 690. While some of this individual variability is surely due to measurement errors from dealing with slippery and uncooperative steelhead, not all of it is. We have proven to our satisfaction that (because of girth taper) there are systematic differences in the divisors of fat and thin steelhead. There also are appear to be slight differences on average between hens and bucks, and there may be slight differences by river as well. Copyright 2006-2013 by T. W. Keelin & Co., Inc. Use with attribution for non-commercial purposes is encouraged.